Bologna, best known for mortadella, lasagna, and tagliatelle bolognese, is also home to raviole. You may be thinking I misspelled “ravioli,” but I didn’t. The raviole (with the “e”) is a cookie native to the region and served, originally, to celebrate the Feast of St. Joseph on March 19 ( a very good day). 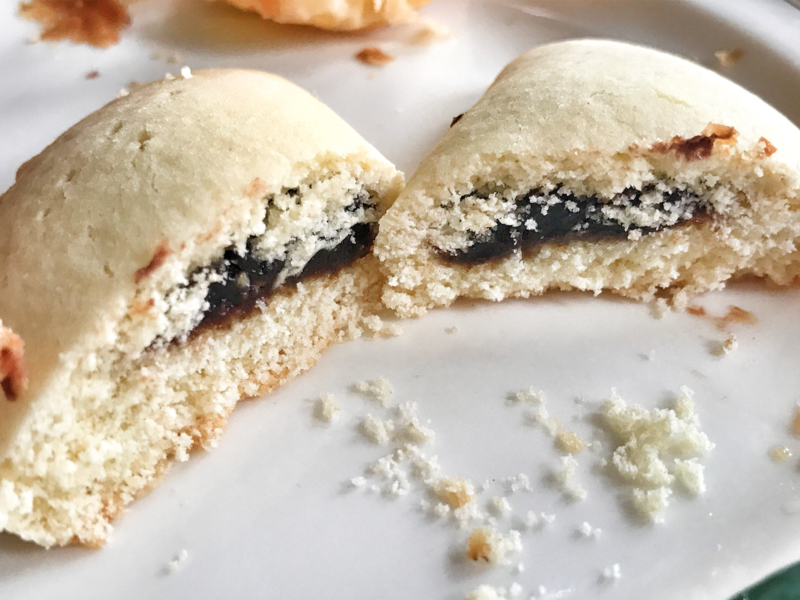 Basically, the cookie consists of a semi-soft dough filled with jam, mostarda (another bolognesi tradition), chocolate, or prune and shaped like a half-moon. (Mostarda, by the way, is a marmalade that contains apples, pears, oranges, sugar, and senape.). The dough consists of flour, sugar, butter, and eggs, and some cooks add lemon rind or flavor. Depending on the area or who makes it, the raviole may be covered in white sugar or powdered sugar, although I usually see them without a sugar coating. I prefer no lemon and no sugar. I’ve always been a cookie lover. My mother was a great baker, and she made some of the best filled cookies. I only discovered raviole a few years ago in Bologna when I was studying here that summer. They have quickly become my favorite cookie, so I have to limit myself to one every once in a few days. I think I love the filled cookies best because I also like pies (Have I mentioned crostatine?) and would choose either of those over cake any day. Yep. I am a cookie junkie. I should mention, by the way, that breakfast at B&B Santo Stefano consists of more than raviole. There are meats, cheeses, cereal, brioche, toast, fresh fruit, and an apple cake that is wonderful. Mili, the gal who works here, makes some of the baked goods. Mix all of the ingredients well and divide into two loaves. Refrigerate for 30 minutes. Roll out the dough on a floured (or sugared) surface and cut into circles about two-inches in diameter. Place some jam in the center of each circle, wet the edges of the dough a little, and fold over to form a moon. Seal. Bake about 10 minutes at 350 degrees.